Are you EXHAUSTED from dealing with the shenanigans of the passing MONKEY year? SURPRISE AFTER SURPRISE from “fabulous to panic-laden” pretty much sums up the energy of 2016 .. doesn’t it? An incredible amount of anxiety, stress, conflict, upset and health challenges touched almost every family, everywhere in the world. Not to mention the massive battles, terrorist attacks, wars and disease that plagued the heart and soul of mankind. If you recall, I predicted all of this (and more) in my last Feng Shui forecast. This was due to the CHAOTIC TWO (2) STAR that occupied the heart of every property last year. 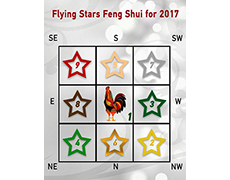 Now as we move into 2017 the stars in the LO SHU SQUARE “rotate,” creating a new cycle of energy and outcomes for us to deal with. FOR STARTERS, THIS YEAR WILL BE A POWERFUL ONE. There will be no middle ground when it comes to moving forward in life. Not in politics, health, love, finances or in your career this year. Victory and success will only be achieved at the price of hard work. Controversy will continue to abound. Thus “diplomacy is a “must” for America, who cannot afford to under-estimate its opponents at home OR around the world. From a Feng Shui perspective, no matter what country you reside in – the LO SHU SQUARE for your environment is a mixed bag of “good and bad” ENERGY in 2017. Thus, I am presenting you with the opportunity to “remedy and enhance” your home and office, as soon as possible – so that that you can bring your life and career into HARMONY, BALANCE and ABUNDANCE before the Feng Shui New Year on February 4th. Not only will I explain “in detail” each star in the LO SHU SQUARE above and its influence on your life, but at the request of many clients’ and customers’ – I will once again share my predictions on love, health, wealth, business, real estate, investments, and what you can expect on the global stage and with Mother Earth as well. CLICK HERE to claim your copy of Feng Shui FORECAST 2017. ← Happy CHINESE New Year..!